Eyes strain seems to become one issue that is so rampant in this present age, and preventing it should be a matter of concern. We strain our eyes by constantly focusing on bright light screen from sources like our laptops, personal computers, tablets, and most especially from our mobile phones. If you should conduct a survey you will discover that the highest percentage of humans that are been affected by eye strains are majorly the youths. This is because they spend much of their time with their eyes been glued to the screen of those gadgets i mentioned earlier. Though the problem of eye strains persist, but it can be prevented and controlled by following some simple tips. Yes, i agree with the fact that most of our activities in our place of work involves using computers which makes us spend long period glued to the screen, but yet, it can still be checkmated to avoid eye strains. Social networking have been the order of the day. This is where the youths comes in. The youth of today are highly involved in social networking, if they are not facebook they will be either on twitter, blackberry messenger, whatsapp messenger, wechat, and the list goes on. All this activities entails spending much of our time with the eyes been focused on the screen of the various device used. All these, eventually leads to straining of the eyes. What is actually the cause of eye strain? I know so many people might be asking such a question, now let us take a look at the reason why it happens. looking at small print for longer period (resulting to hours) can result in eye strain, fatigue and headaches. You will testify to the fact that whenever you spend much time looking at either the computer screen or that of your laptop or other devices, you end up developing headaches. The eyes becomes dry while a person is looking at computer screens and other digital devices as a person's blink rate decreases by one-third to half of its normal rate. Keeping the monitor of your computer at a distance is quite helpful in preventing eye strain. The monitor should be at a distance of 25 inches or an arm's length away from your face. And also you should consider increasing the size of your monitor. Try using a matte filter to reduce glare. You will observe that newer phones and laptops can produce a strong glare that is quite irritating to the eyes, causing eye strain. Using s matte filter will reduce the amount of light rays reaching the eyes. Some people might be asking, what is the 20-20-20 rule? This rule means when you are working and focusing on the screen, you should take a break every 20 minutes and look at an object (preferably black object) 20 feet away from you for 20 minutes. Observing this will help you relax your eyes, thereby preventing eye strain. You can also use a desktop humidifier or artificial tears to keep your eyes moist. 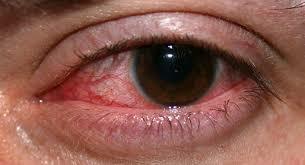 humidity-controlled offices and heaters can dry out the eyes during winter period. The eyes easily got strained when you are looking at a computer screen that is brighter than its surroundings. Try to increase the contrast on your computer monitor.